When committing in GitHub for Windows, is there any way to add all files listed as to commit in the .gitignore file at once? 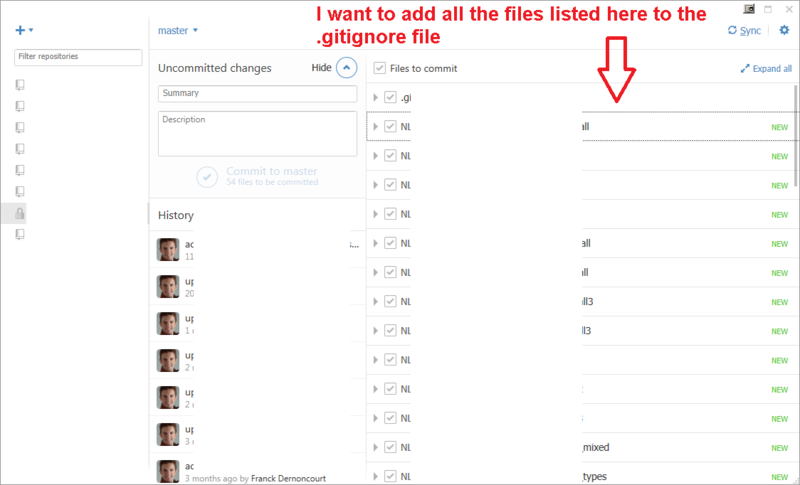 There is currently no way to add all files listed as to commit in the .gitignore file at once in GitHub for Windows. Not the answer you're looking for? Browse other questions tagged windows-7 git github or ask your own question. I see “Uncommitted changes” but the files are identical? Is there a way to edit a commit message on GitHub? How can I make Github for Windows use my real name for commits? Fastest way to clone a github repo to computer without having to delete older versions, just update the changed files? When viewing a commit on GitHub, there is a file listed with #--># appended to it (see picture). What does it mean?